I've taken "a light summer read" to new levels this past month. About a year ago, I stumbled across this series of books grouped under the category of "A Proper Romance," meaning, the book is a romance, but it's full of proper, chaste, upright behavior. And I have to say, I've loved them. Some are forgettable, some are memorable, all of them are page-turning "I cannot make dinner because I have to finish reading this story!" kinds of books. 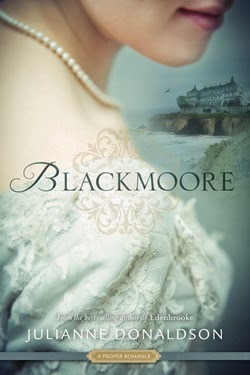 The Proper Romance books are Edenbrooke and Blackmoore, written by Julianne Donaldson (both stand-alone novels) as well as Longing for Home and its sequel Hope Springs by Sarah M. Eden. I have read all but Hope Springs, which I'm pretty eager to get my hands on. And the problem with reading a couple good books by an author is that you then feel compelled to read all the books that author's written. So add to that list Seeking Persephone, Courting Miss Lancaster, and The Kiss of a Stranger, also by Sarah M. Eden. They have all been very fun books. Seriously fun. I highly recommend them all if you, like me, adore a good love story minus the steam and clothing removal. A love story like Jane Austen used to write. Not that the characters in these books really compare to the complexity of a good Jane Austen, but ya know. They're just good, addictive fun. Sorry I didn't reply sooner, I was away on vacation. Blackmoore was my favorite. It had the most legitimate reason for the guy and girl to not get together sooner, if that makes sense. It is lovely. My second favorite would be the Longing for Home/Hope Springs duo. I read the second of these in its entirety on my recent plane ride home. If you go for the Sarah M. Eden books, read Seeking Persephone before Courting Miss Lancaster. The one precedes the other chronologically. Enjoy!